Yamaguchi Pref. endeavored to protect the endangered damselfly by mitigation since 1998 for near 20 years. The photo under left hand is the damselfly called “Hinuma　Itotonbo” The dragonfly right hand is called Bekkoh tonbo endangered species too. It was found temporally near 2003 or 2004. As the damselfly is very small and difficult for us to find, the impact appealing us might not so big comparing with Bekkoh-tonbo. In 1995 Hinuma-itotonbo was discovered and the construction of the seaside road started in 1997, and the conservation measures committee of Hinuma-itotonbo was established next year.. 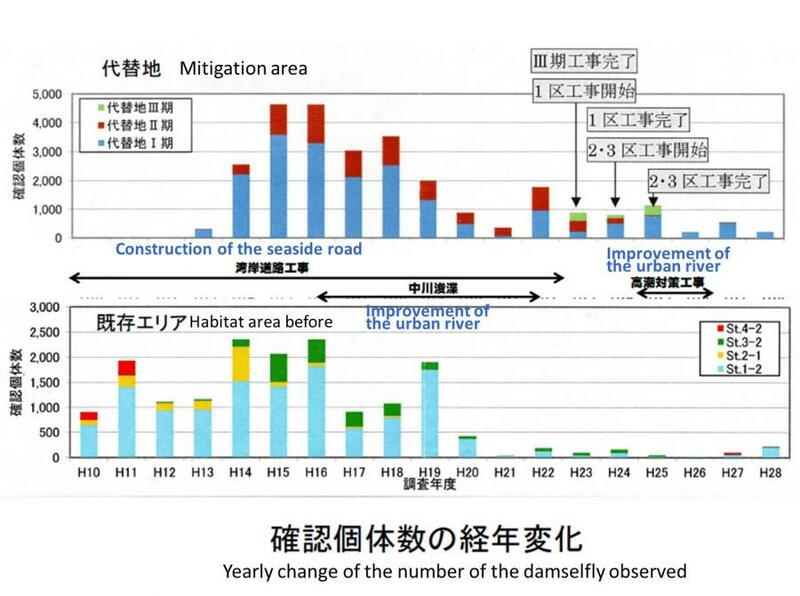 It was confirmed that mitigation areas were developed in 2000-2001 and since 2002 it was confirmed that Hinuma-itotonbo is living well, but since 2004 Nakagawa dredging work against flood was started, the number of the dragonflies gradually declined. 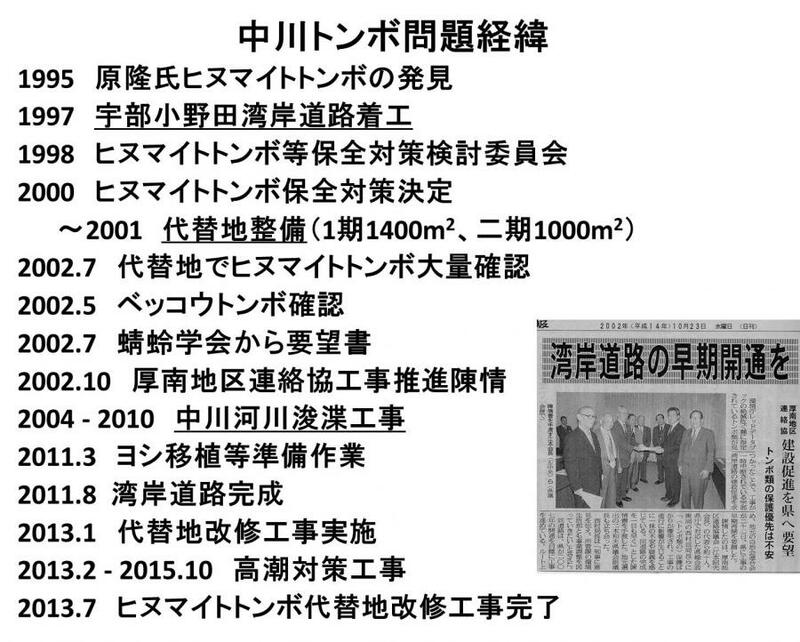 In October 2002, the local Kohnan district liaison council petitioned Yamaguchi Prefecture so that the road construction would not be delayed due to the measures protecting dragonflies. The design improvement of the mitigation field was proposed in the committee in 2010, and the renovation works were conducted in 2013. After that, during the period from 2013 to 2015, the bank improvement of Kotoh River was carried out against storm surges. 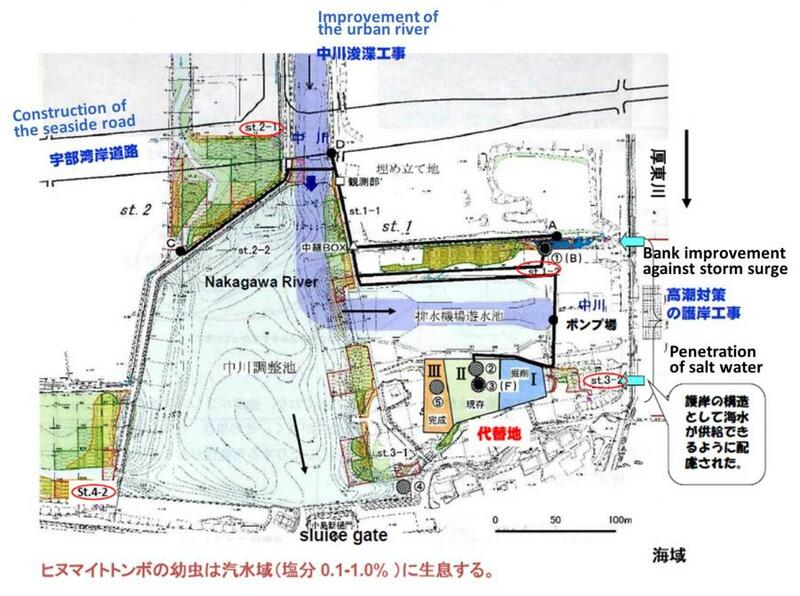 Main works relating to the mitigation project were road construction, Nakagawa river improvement to prevent flooding and the bank improvement against storm surge. 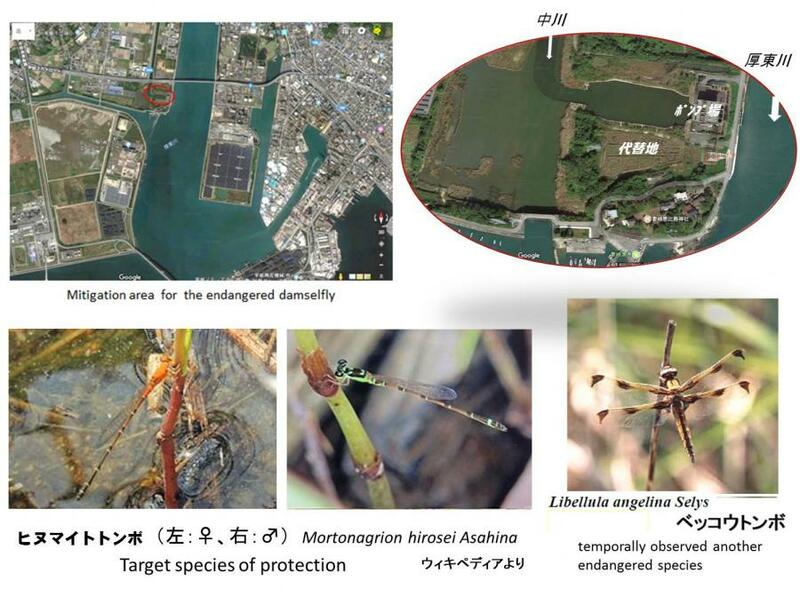 They influenced to the population of damselfly in mitigation field, respectively relating to the loss of inhabitant area, decrease of fresh water supply and salt water supply. The plan proposed by the committee in October 2010, was as follows. 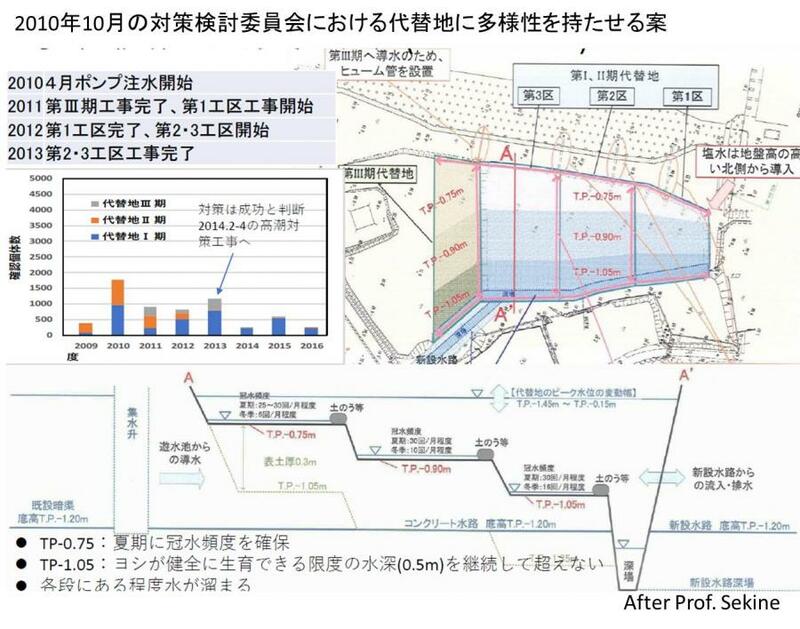 The ground height of the mitigation field designed to be lowered southward by three steps to ensure stability such that Hinuma-itotonbo can survive somewhere even if the environmental conditions change. When the water level in Nakagawa rises during rain, fresh water is supplied both from the north side and the south side. On the other hand, saltwater penetrate from the eastern side of Kotoh river and supplied from the gutter set north side. Since the prefecture can not get the budget after the completion of the three projects, from the year 2016, the nature conservation groups have carried out mowing grass, monitoring of the damselfly and trash cleaning work. 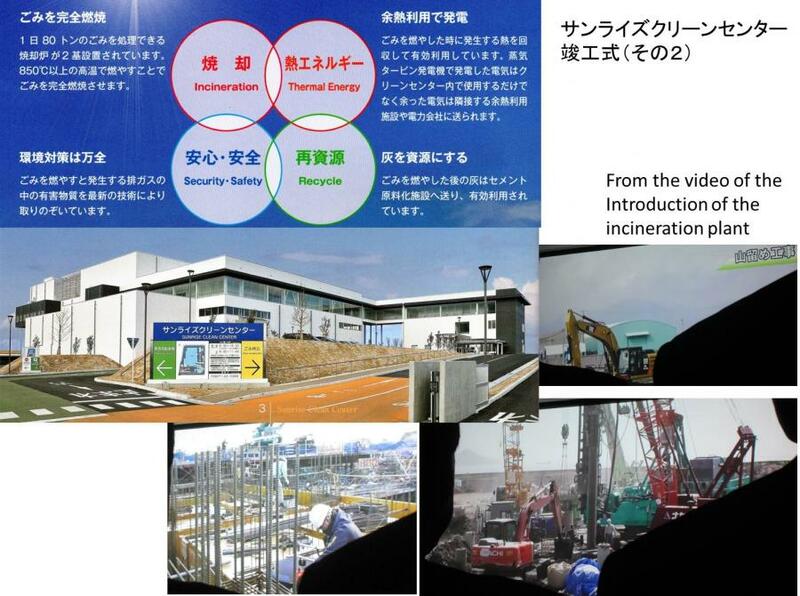 Especially in the year 2018, the amount of rainfall was small, the number of Hinuma-itotonbo was very reduced, and we consulted with a prefectural parliament member as to whether the prefecture could do something. Before that we should consider more concrete measures to be expected. Anyhow it is not easy to regenerate suitable environmental condition for certain species artificially. Copyright © Ube City Kankyo-Portalsite all rights reserved.